Kids. Can’t live with them. Can’t kill them…or can you? Well, in two new movies with young boys as central characters, infanticide might not be such a bad idea because if you don’t, they might get you first. 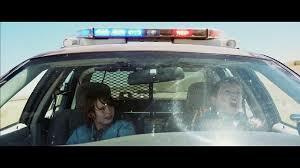 Cop Car is a nice, tight little thriller about two pre-teens who are wandering across some wide open spaces common in their part of the country. They seem to have run away for some reason which is never explained (there’s a lot that is never explained in the movie, which is fine, since such explanations are often irrelevant as it is and would only get in the way). They come upon an abandoned cop car, the sheriff nowhere in sight, find keys in it and, hey, boys being boys, they go joy riding…unaware that there is a body in the trunk. Okay, I’m sorry, but this is a pretty neat set up for a couple of hours in the theater and the movie does an excellent job of fulfilling all expectations. It’s one of those films that doesn’t really do anything, but in the end, whatever it doesn’t do, it certainly does it rather well. The movie is co-written by Jon Watts and Christopher D. Ford. Ford gave us an earlier piece of sweet whimsy called Robot & Frank and Watts has given us such fare as Clay Pride: Being Clay in America, Jewish Santa is Coming and Our RoboCop Remake so I’m sure this bit of nasty, neo-noir edge of your seatness type falderol was a logical step for both of them. The screenplay is very, very adroit in how it plays out its plot twists and has such clever bits as an incredibly smart use of a beer bottle and a scene where the two boys have to use all their ingenuity to get out of a backseat, which being in a patrol car, has doors that can’t be opened from the inside. Watts also directed and he makes nice use of the endless vistas and locations that are in the middle of nowhere and he definitely keeps the tension up and story moving. He’s set to helm the Spider-Man reboot—as I always say, do something good and you will be punished for your success. 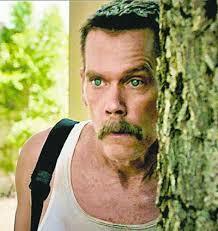 The movie has as its lead Kevin Bacon who, in the role of Sheriff Kretzner, seems to be having a whale of time in this offbeat role. The look on his face when he returns to where he left his car to find no vehicle there is priceless. It’s quite possibly his best performance. James Freedson-Jackson and Hays Wellford play the two friends Travis and Harrison with a believable chemistry. The cast is round out by Camryn Manheim as a concerned motorist and Shea Wingham as the body in the trunk, both solid and effective. With Bacon’s wife Kyra Sedgwick as the radio dispatcher. Goodnight Mommy (original title Ich seh, Ich seh or I see, I see) is a German film with two young teens at the center as well. Well…sort of. This time, instead of friends, the boys are twins, brothers Elias and Lukas (the real names of the actors) and they live in a lovely, if impersonal, modern style house far from everyone near a lake and beautiful countryside where they run and cavort and play their hide and seek games. But the twist is that only one of the twins is there. This isn’t a big surprise, or it shouldn’t be. The opening scenes are of the two being barefoot boys with cheeks of tan, malarking around, until it reaches one where Elias is floating on a lake calling out to Lukas who seems to be staying under water a bit too long for comfort. The title card comes up at this point, but it’s obvious that once the present day story begins, Lukas will be dead and only Elias can see and talk to him. Their mother (never given a name) returns home after undergoing some plastic surgery (she’s a minor celebrity on TV), her face wrapped in bandages. There is already some underlying tension between mother and son, most, but not all of it due to Elias insisting that Lukas is there and wanting her to acknowledge his brother. But whatever anxiety exists is compounded by this German Vanna White having had an operation and needing time to relax and get her life back together. The movie is written and directed by the duo Severin Fiala and Veronika Franz and they have created a creepy atmosphere of moody visuals. It’s the kind of horror that is a slow burn and sneaks up on you. And when the second half happens, when Elias and Lucas suspect that this person who at first has bandages on and then, once taken off, no longer looks like her former self, is not really their mother, and they decide to take action against someone who they don’t believe is who she claims she is, the horror becomes more than palpable. 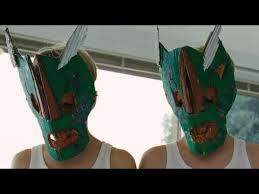 Goodnight Mommy is a success in spite of some structural issues. It’s basically a movie that starts out in one direction and then changes. The first half is about these twins and the conflict between one not being there and the mother frustrated and angry at Elias not letting go of the memory. The problem here is that it feels like Fiala and Franz are going out of their way to try to fool the audience, to try to make them think that both boys are there, but it’s too late since it’s obvious from even before the title card that this isn’t the case. The second half, that of the twins claiming this person isn’t their mother, is the most successful and horrifying. It’s a little odd that the writers weren’t able to bring the two through lines together. It would have been simple enough. Instead of looking as if they were trying to fool the audience, the filmmakers probably should have had Lukas trying to first rouse Elias’s suspicions and then try to convince him that this woman isn’t the person who gave birth to them. But I think Fiala and Franz waited too long to do that. Still, there is so much going on here that is effective and the build to the horrifying conclusion is so riveting, that the movie has little problem working its spell on the audience. The movie is a first feature as directors for Fiala and Franz. Franz is best known as co-writer on the series Paradise: Love, Paradise: Faith and Paradise: Hope with Ulrich Seidl. The cast is made up of Elias and Lukas Schwartz as the twins and Susanne Wuest as the mother.